SillyBilly has had a permanent tooth erupting for the last few weeks. It was there, coming up quite shyly behind his slightly loose milk tooth, right in the bottom front. Today the dentist pulled that little shy milk tooth, plus the two next to it for good measure, to allow the permanent teeth to settle in nicely in their appointed spots. We all know what a momentous occasion the loss of the baby teeth is. How big the child is, moving into a new phase of life! But what does this event mean from a spiritual perspective? 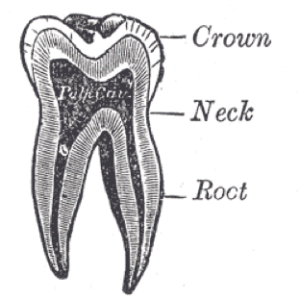 Rudolf Steiner spoke many times about the significance of the change of teeth. He explained that for the first seven years or so, the child’s physical body is being built up by the etheric (or life) body. The peripheral formative forces mold the physical organs and systems, and set them in their right relation and functions. Another aspect of this formative phase is that the very young child has an inherited physical body, one that is the product of heredity. If you observe a room full of babies, you will see a marked similarity in their forms and faces. It is as their bodies are merely prototypes. In this first phase of human life, the child constantly remolds this inherited body into essentially a brand new, self-created physical body. This is part of the wisdom behind all of those colds, infections, and childhood diseases: to help the child re-create the physical body anew, so that the child’s spirit can have a distinctive vehicle all its own. When this remolding process is complete, the child has exchanged the generic prototype for his or her true, individualized body. I have recently observed how different SillyBilly’s facial structure is, how he somehow looks “older” and more awake, and more individual. The change of teeth is a visible, tangible sign of this work. The inherited milk teeth are literally pushed out by the permanent teeth. The child’s etheric forces have done their intense physical work, and can now be freed to help the child’s soul and spirit, with thinking and memory. One thing Waldorf teachers and physicians have noticed is that children’s permanent teeth are erupting sooner. 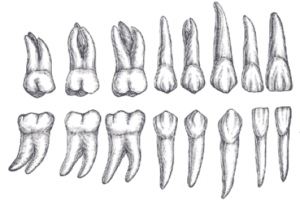 Steiner always mentioned age 7 as the time of the change of teeth; now it is more likely to be 5 or 6! Many people theorize that this is a sign of the overall speeding up of child development, possibly exacerbated by the general intellectualization and abstraction of modern life. Perhaps our etheric forces are being forced to finish their work too soon. Some anthroposophical physicians are concerned that this may cause negative health effects in the future, because the etheric forces are somehow weakened by not being allowed to develop in their own time. At about the seventh year the human being is actually born a second time; that is to say, his etheric body is born to free activity just as his physical body is at the moment of physical birth. As before birth the mother’s body works on the human embryo, up to the change of teeth spiritual forces of the cosmic ether in a similar way work upon the etheric body of the human being, and about the seventh year these forces are thrust back just as the maternal body is at the time of birth. Up to the seventh year the etheric body is as if latent in the physical body, and about the time the teeth are changed what happens to the etheric body can be compared to the igniting of a match. It is bound up with the physical body, but now comes to its own free, independent activity. The signal for this free activity of the etheric body is indeed the change of teeth. For anyone who has a deeper insight into nature this change of teeth holds a quite special place. -Rudolf Steiner, Berlin, 13 December 1906.